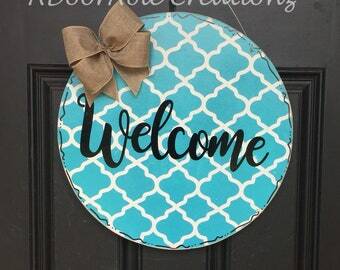 Free shipping to United States with $19.95 purchase from ADoorAbleCreationz. See item details below for sale terms. 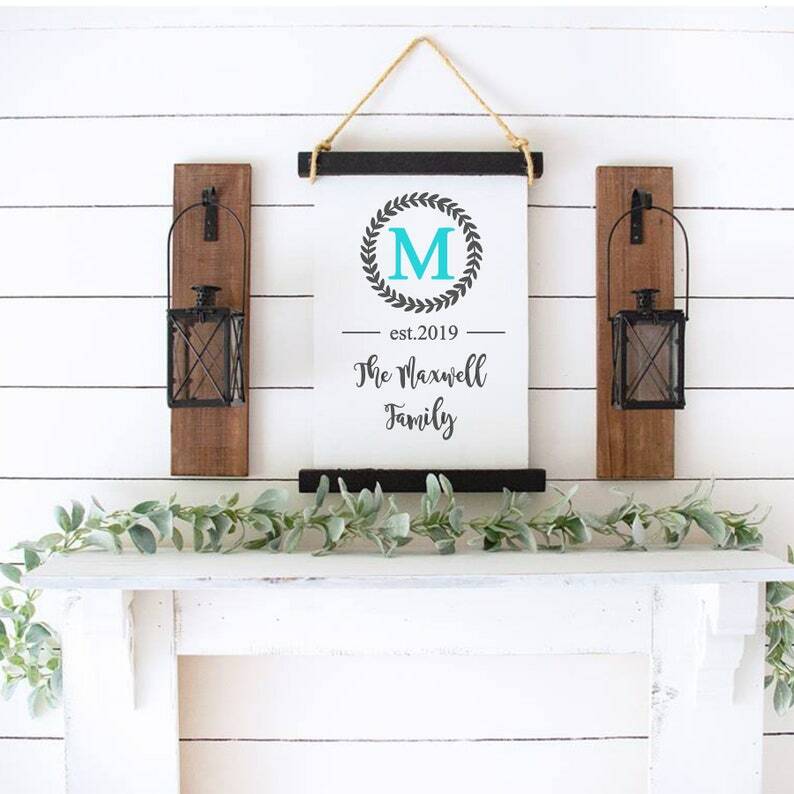 This family name wood scroll sign is perfect addition to your home. It is built with the canvas scroll sign style in mind but is made of wood for additional stability. The sign features the year your family was established along with your initial and personalized with your family last name. 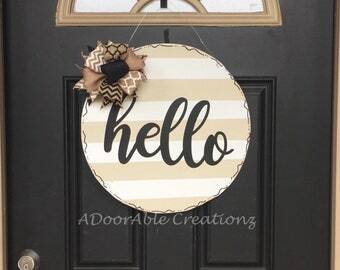 This family name sign would also make a great house warming gift! The initial is centered within a laurel wreath. Sign measures approximately 22x16 has been stained with a dark brown stain and hand painted to perfection! Please enter initial family name and established year at checkout. Also indicate color to use for the intial. Vinyl is not used used on the sign. If you would like a lighter stain please let me know. also may be imperfections (knots) that make each piece unique. No two signs will be alike. Expedited my order, thank you. Was a shower gift and everyone loved it! Well painted, lightweight, and a great addition to our home! Payment is expected at the time of sale. I am happy to accept all major credit cards, debit cards, PayPal and Etsy gift cards. Production is not started on your item until payment has been cleared. If you wish to cancel your order, you must do so within 24 hours of your initial purchase. I take pride in my work. I would never want to send you something that I would not want to have myself. I wish to provide excellent customer satisfaction- contact me if there are any concerns or problems. It is my wish that no item is damaged. In the case that it is, you are protected. Each item is sent either priority mail or parcel select which offers insurance of up to $50. If your item is damaged in shipment, please save the box, and ALL of the packing materials so that it may be inspected by the carrier.You will have the choice of either receiving a refund or a replacement item. If you request a refund, contact me within 3 days of receiving your wreath to be eligible. If a refund is requested, I will require that the item is returned. There will be no refunds on custom orders or wreaths/ door hanger monograms as these items are specific to the customer who purchased it. If your custom or monogram item is damaged via shipping, please contact me within 24 hours of receipt .In addition, please provide pictures of the damage, shipping box, and shipping label. A insurance claim will be filed and I will be happy to provide either a refund or a replacement item. If a refund is requested, I will require return of the original item. We do not accept returns in situations where there are no damages or errors on our part. If your item is lost by the carrier, please convo me as soon as possible. I will be happy to work with you and the carrier to recover your item and provide options to resolve the issue. From time to time ( especially during peak volume times such as holidays), the time frame provided by the post office for Priority ( 1-3 business days) Parcel Select (2-9 days) or Fed EX Home ( varies) is delayed or their tracking is not updated in a timely manner due to reasons outside of my control. If your package is not received within the timeframe listed on your tracking, please contact me via email or Etsy convo as soon as possible. I will contact USPS on your behalf and request a case be opened to locate your package and update the tracking. As of 8/12/15, I am unable to provide a refund of the shipping cost due to delays caused by the carrier responsible for delivering your package. Your items are shipped out after the processing time provided on the listing. I ship through USPS & Fed EX both with delivery confirmation. An email will be sent with our tracking effort. I make every effort to keep shipping costs as low as possible The Shipping Method used is normally Priority Mail (USPS), Parcel Select (USPS), or Fed EX (Ground or Home Delivery) depending on the size weight, and destination of the package. 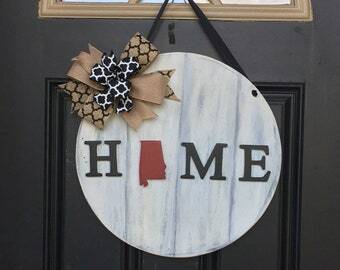 To maintain low rates, most locations close to Alabama ( Neighboring states, Eastern and North Eastern states) usually can be shipped Priority mail (1-3 days). All others (including TX, South FL, CA and anything else out west) will go Parcel Select (2-9 days). or via Fed EX. AK and HI have proven to take longer than the 9 days promised by USPS. " Please note that Priority Mail and Parcel Select automatically include insurance. From time to time ( especially during peak volume times such as holidays), the timeframe provided by the post office for Priority ( 1-3 business days) Parcel Select (2-9 days) or Fed EX Home ( varies) is delayed or their tracking is not updated in a timely manner due to reasons outside of my control. If your package is not received within the timeframe listed on your tracking, please contact me via email or Etsy convo as soon as possible. If you are local, within the Birmingham ( Hoover, Pelham, Helena, Alabaster, etc ) area, we can arrange pick up in order to avoid shipping. If you would like to arrange pick up, please enter code LOCAL at checkout and convo me to make arrangements for pick up. Please note that while we make every effort to make sure your item gets to you in a timely manner, once it leaves our hands, it is also out of our control. If you are having any issues after it ships, please contact the shipping service first to ask about your package! I will be happy to work with you in correlation with the shipping service.. 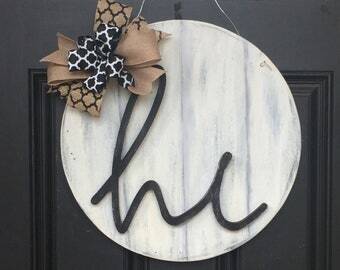 Custom Requests: Work on a custom wreath request will not start until after payment has been submitted. Full payment is required at the time of order. Once a full payment has been received the wreath will be created according to the shipping time provided in the listing. My wreaths are all handmade with care and durability. In some cases the ribbons and decorative picks may vary slightly, but will be match as close as possible. If you display your wreaths outdoors the deco mesh is very durable. However, do protect your wreath from direct sunlight, moisture, wind and other outdoor elements. If you are sending wreaths as a gift, I am glad to include a note card with your special message. Please indicate this information in the notes of the order. Information regarding size is listed within the description of each item. From time to time, we do offer sales and promotions. Check out our Flash Sale Sections for offers.